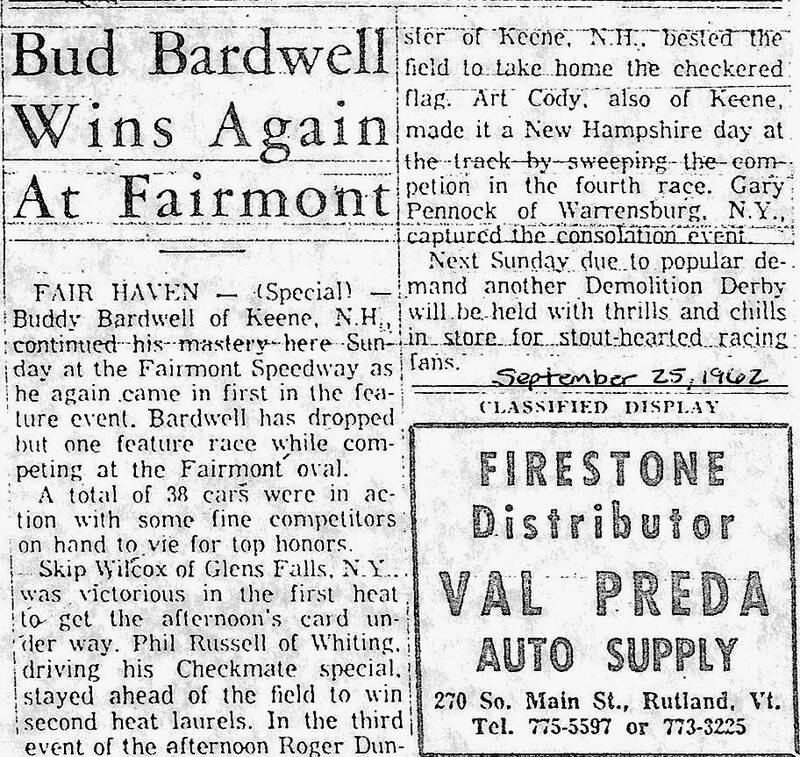 Buddy Bardwell, of Keene, New Hampshire raced as much in Vermont as he did in New Hampshire. He drove his first car in 1951. 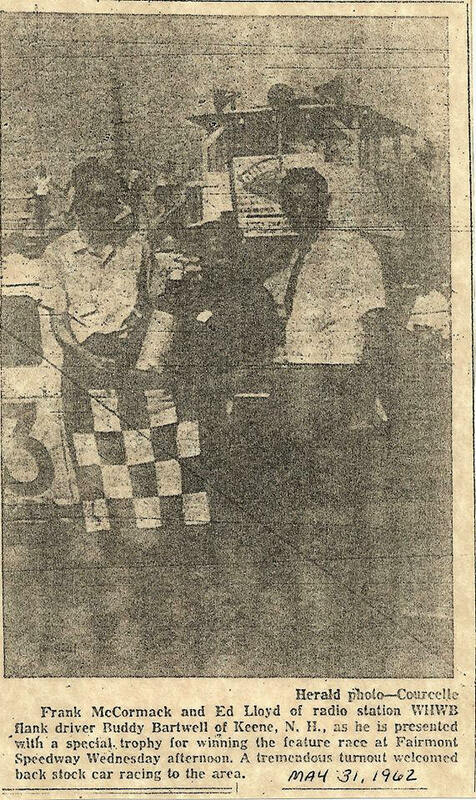 He remembers running Pico Raceway, in Rutland, and Stateline Speedway in Bennington in those days. 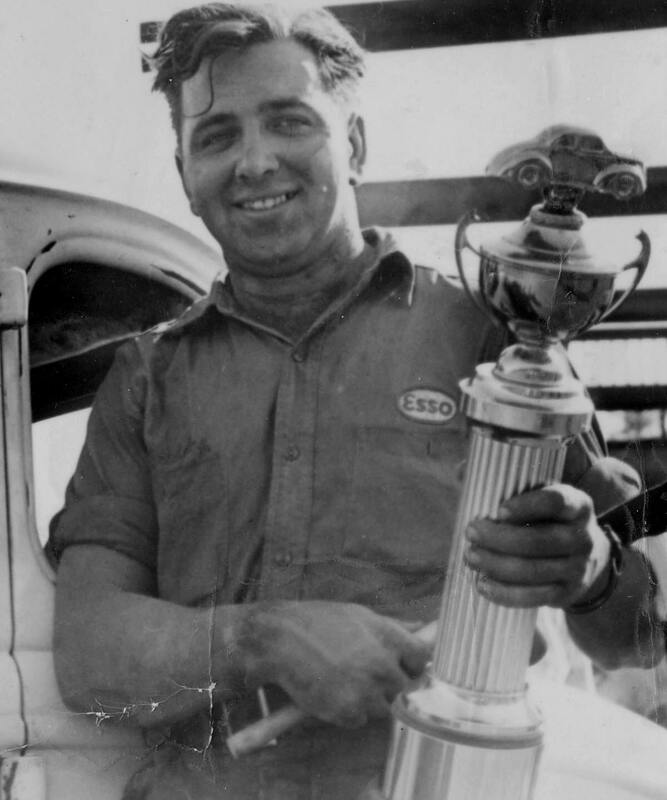 Bardwell was one of the most traveled race car drivers of any era. 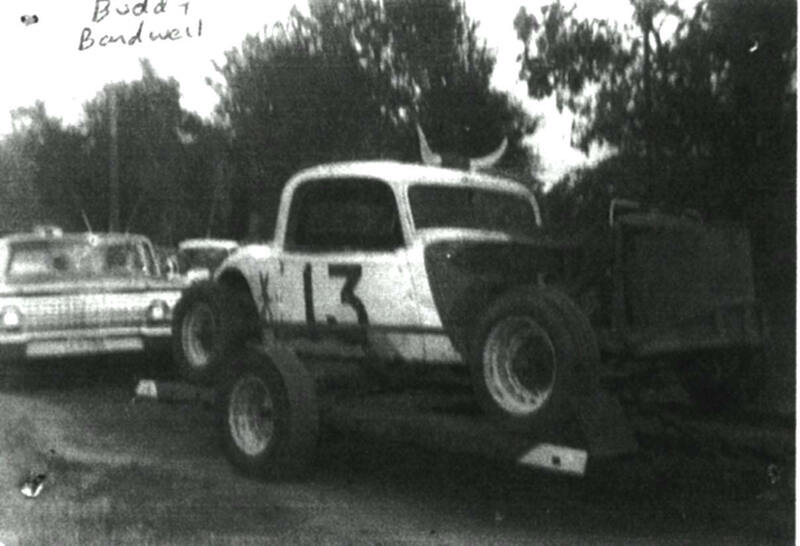 He was until the end - trailering his #13 all around the Northeast to race in vintage race car exhibition races. 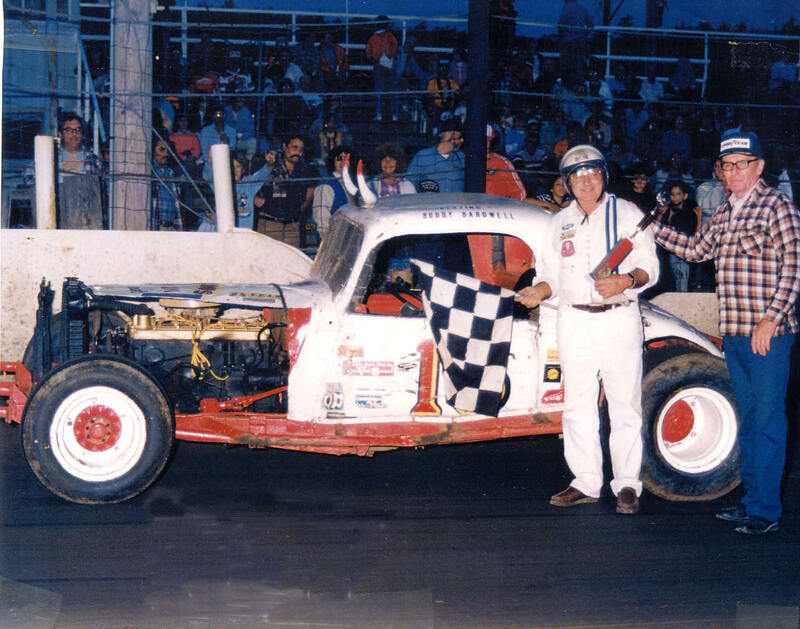 Bardwell raced at Thunder Road on a fairly regular basis around the very beginning of the 1960's before appearing at Fairmont Speedway and Otter Creek Speedway a couple of years later. Bardwell won the first feature at C.J. 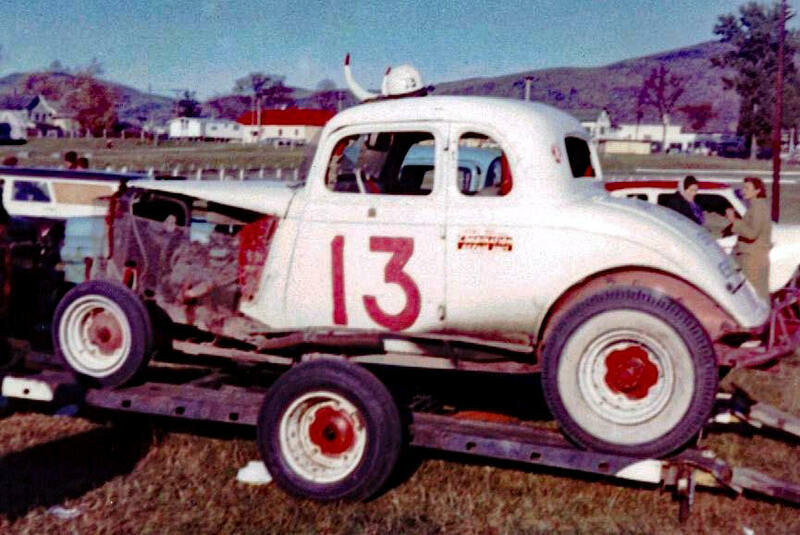 Richards' Fairmont Speedway in 1963 with a number 13 Ford not yet sporting his trademark bullhorns and Hudson car. He had built the Ford for T Road and used it until the end of 1962. Buddy once confided that he was going out to Indiana, to a Hudson convention. He said he had the last functioning Hudson race car in existence; som the y really wanted him out here. 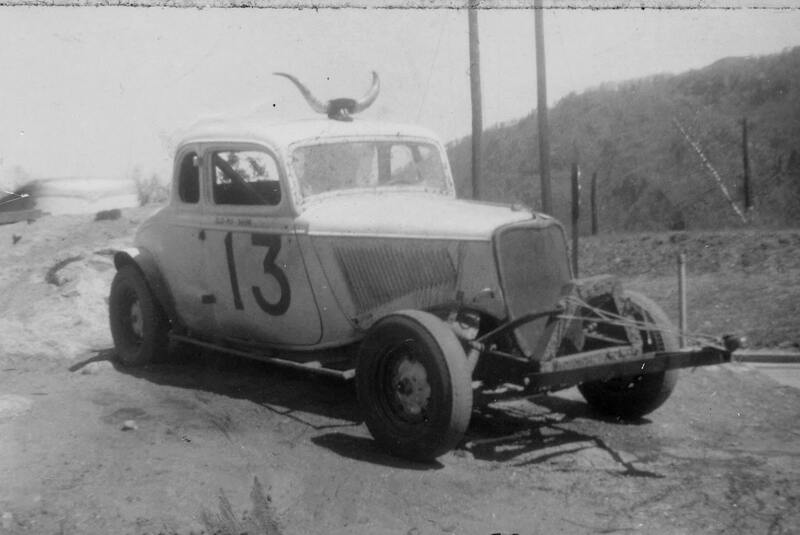 At that time, when there were some restored Hudson Hornets out there, he was still campaigning his little coupe at places like the Midstate club, where they still actually raced the cars. Buddy had this portrait done when he was running Thunder Road. The first Bardwell car - which probably ran Pico and Stateline, to name a few. An early car with bullhorns. Buddy and the Brayley brothers work on an early car with bullhorns to race at Safford Park, Cheshire fairgrounds. 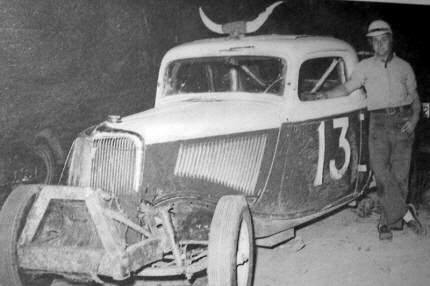 Another early car with no bullhorns that he drove at venues like Rhythm Inn and Brattleboro Speedway. This is said to be a 1949 car. It could be but it looks more refined than the the first photo at right, so I doubt it. 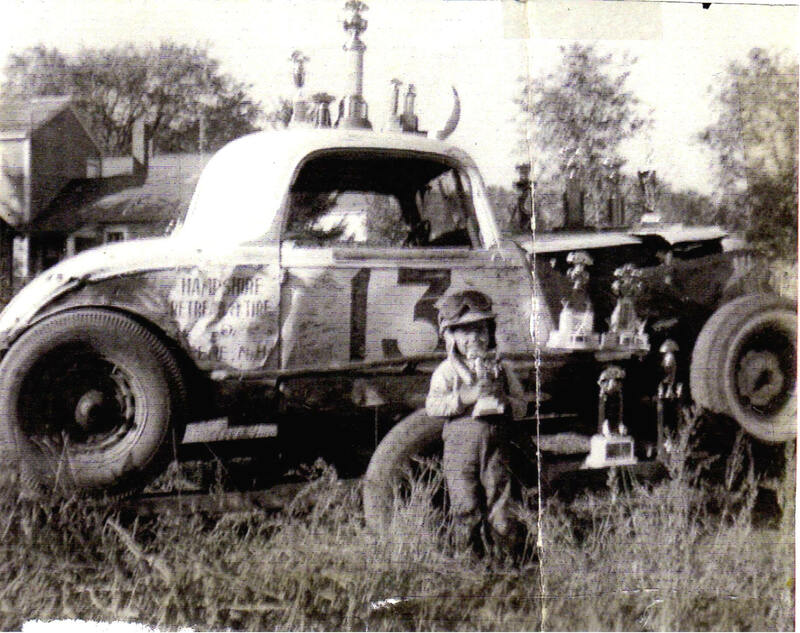 This is said to be a 1952 Brattleboro Speedway championship trophy. This is a car in the pits at Brattleboro Speedway. 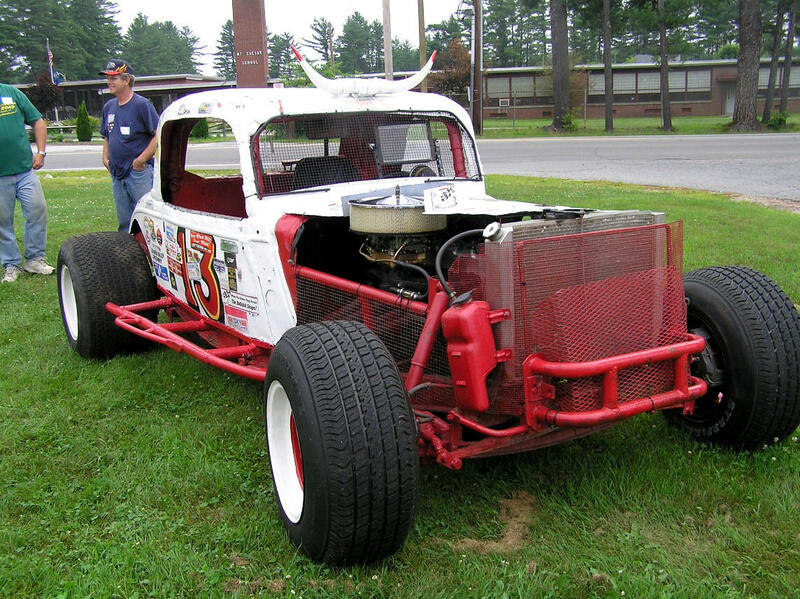 This is the same car in the pits at Brattleboro Speedway. From the Cho Lee Coll. 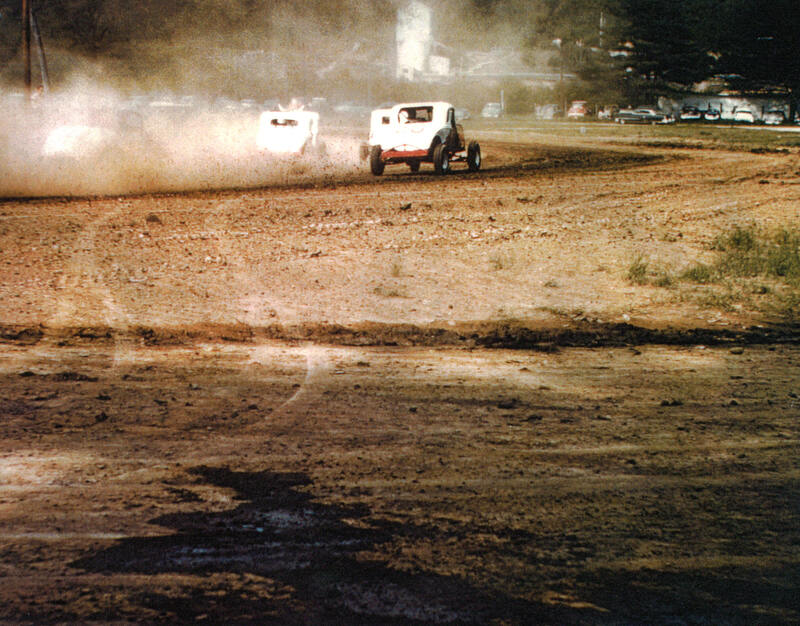 Buddy goes inside 23, Ray Schnyer at Safford Park Speedway in 1957. 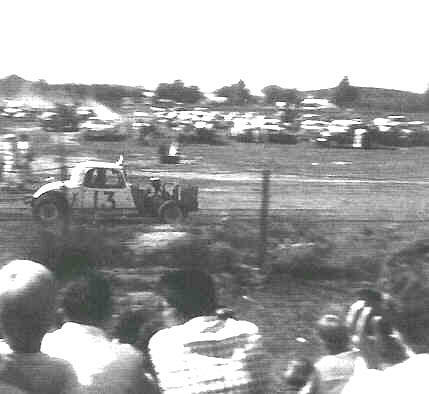 One of the first Hudsons, at speed at Safford Park Speedway in 1957. 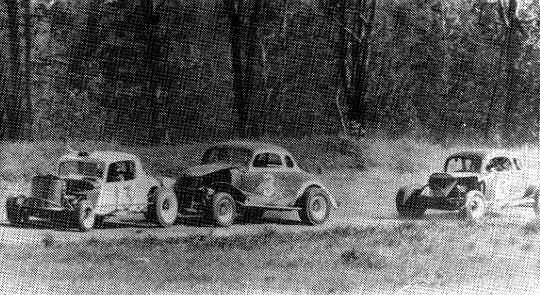 He leads Ernie Johnson, is beside George Schnyer, and trails an UNK car 22. 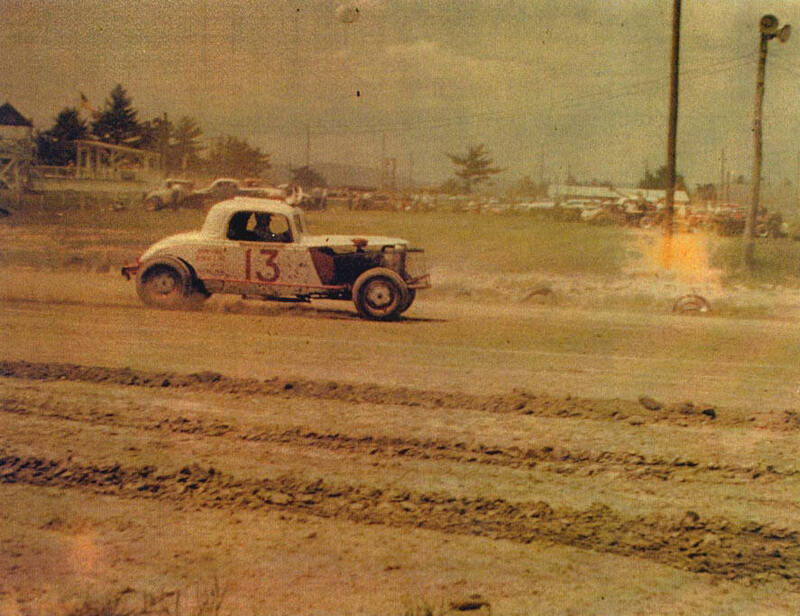 One of the first Hudsons, at speed at Safford Park Speedway in 1957. 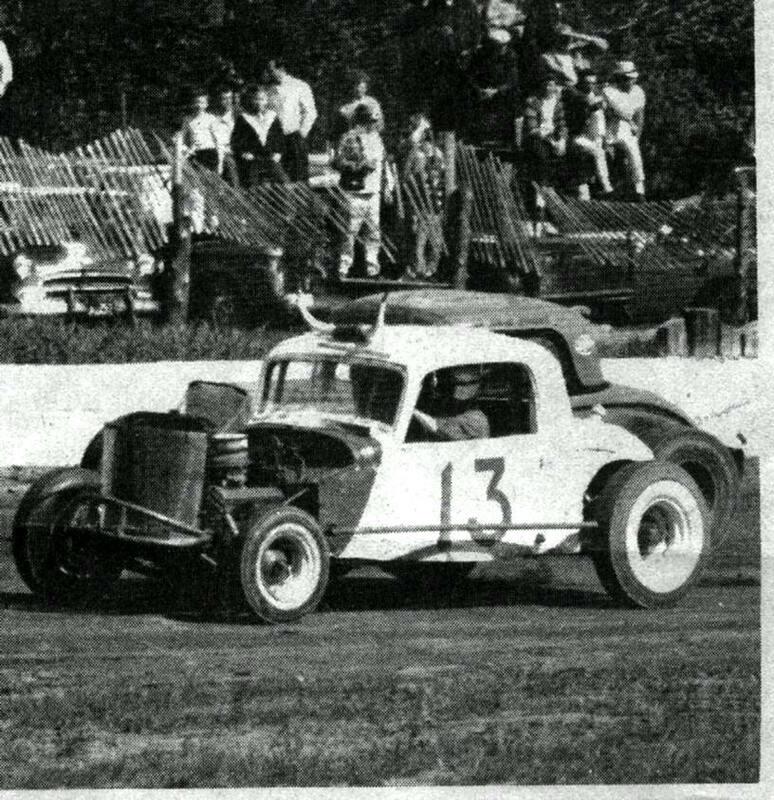 One of the first Hudsons, at speed at Brattleboro Speedway Speedway in the early 1950's. From the Lew Boyd Coll. 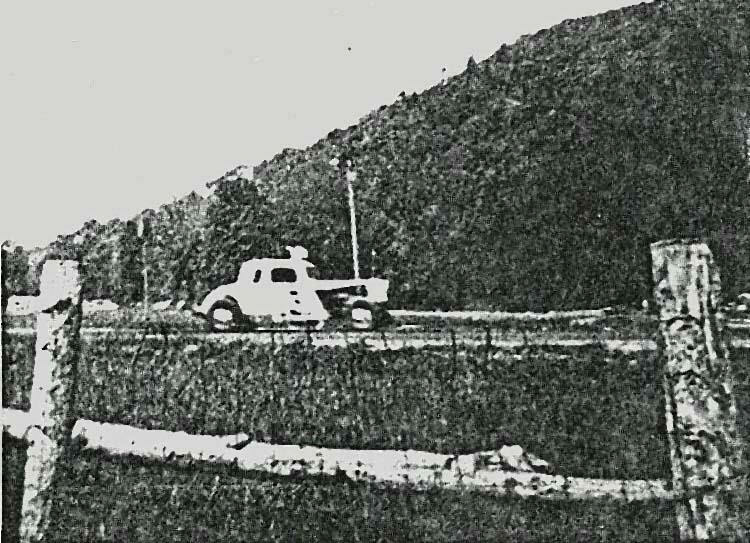 One of the first cars, in the rear, at Brattleboro Speedway in 1950's. He is behind the likes of Joe Ryan [X] and Lionel Arel in the DN3. 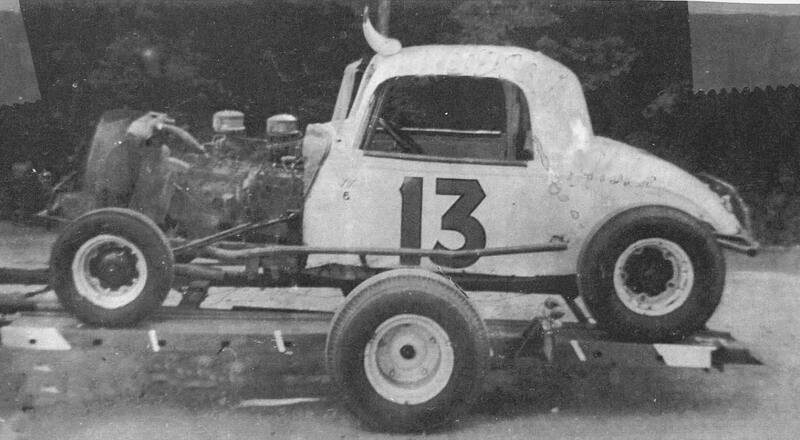 One of the first cars, in the rear, at Brattleboro Speedway in 1950's. Seen in the shot are: 621, Art Rousseau, 71, Morris Wissell, and Ray Harris in Chet Cashman's 37. 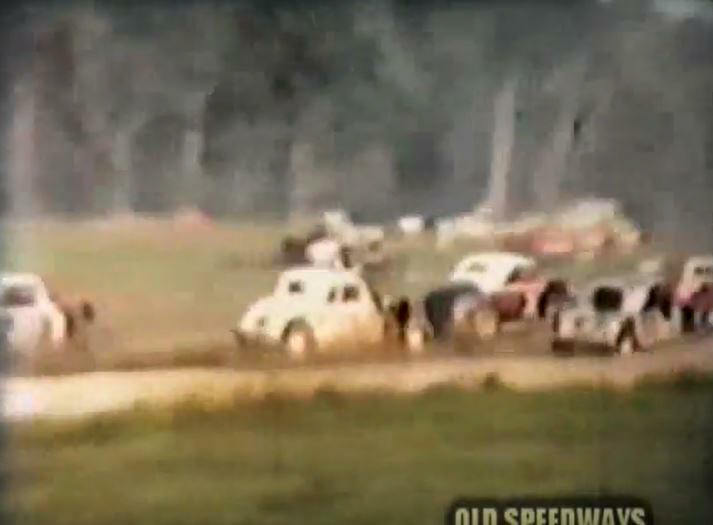 More grainy old 8MM footage shows Bardwell ahead of Joe Ryan at Brattleboro Speedway Speedway in the early 1950's. 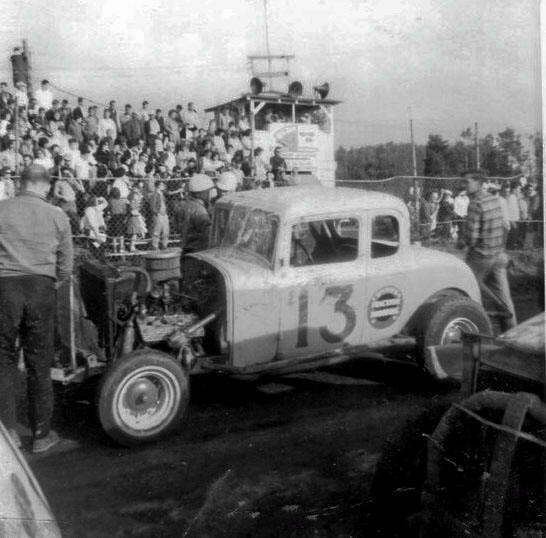 More grainy old 8MM footage shows Bardwell behind Joe Ryan in a crowd at Brattleboro Speedway Speedway in the early 1950's. 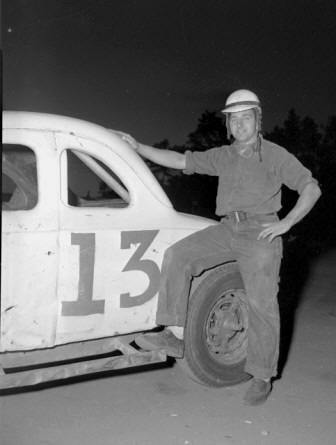 Bardwell and a Fred Snape car at Brattleboro Speedway Speedway in the early 1950's. Buddy on the track in Keene, NH. 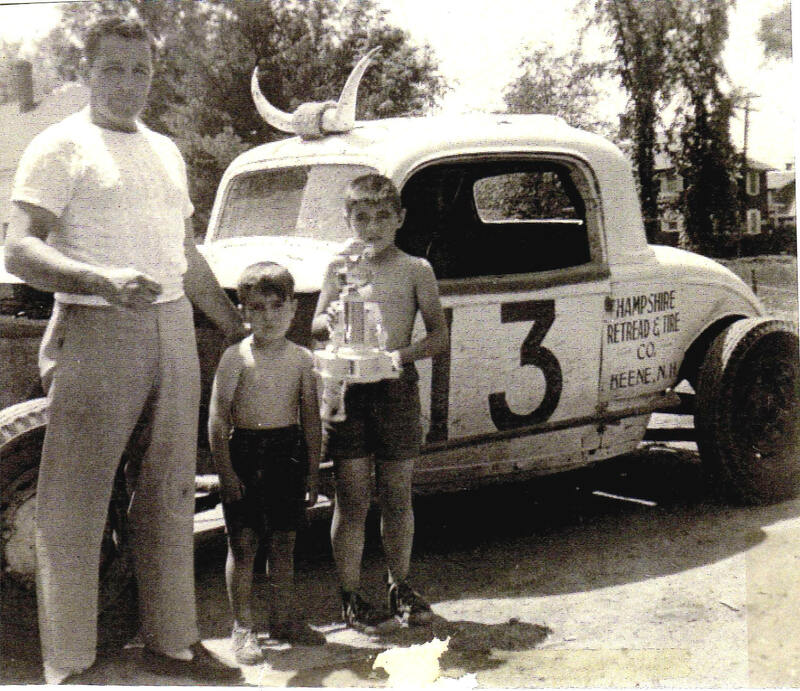 Said to be holding the Brattleboro Speedway title trophy around 1952. The Bardwell boys around one of the Hudsons. 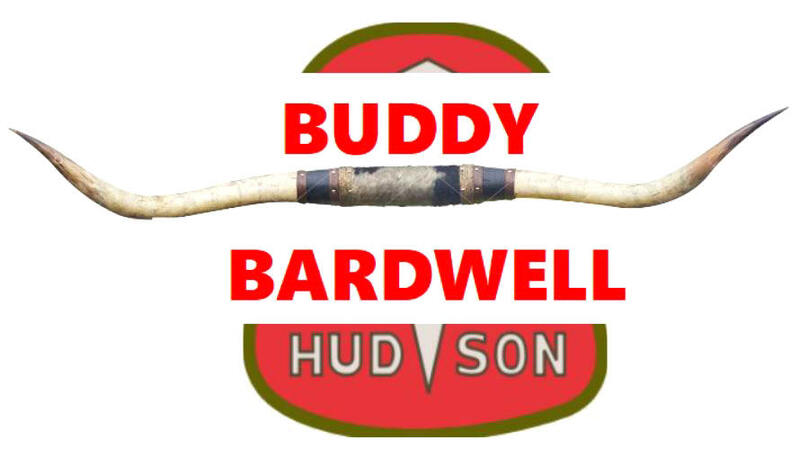 Buddy and the Bardwell boys around one of the Hudsons. Not sure what the trophy is from. The car he built for Thunder Road - seen at an unknown location. 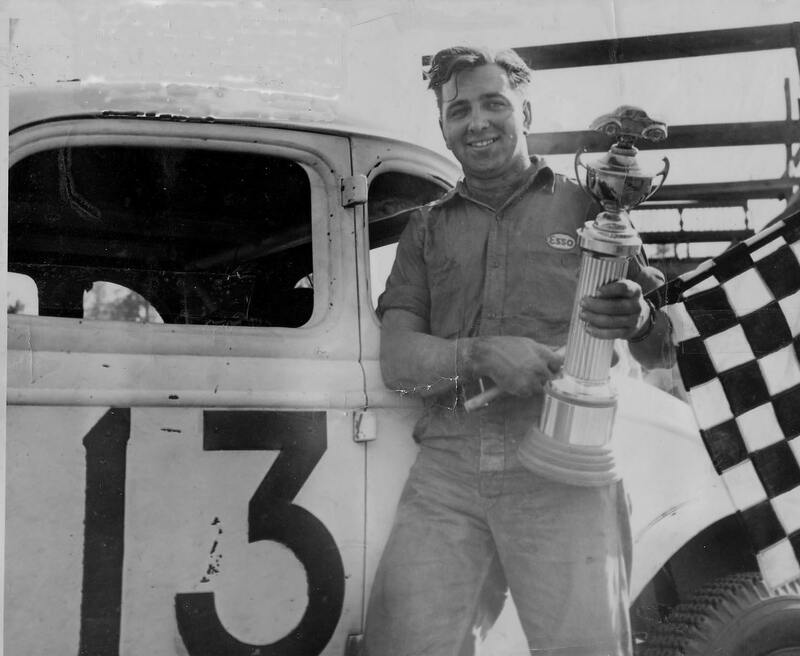 The T Road Ford carried him to the first win in the history of C.J. Richards' promotion at Fairmont in 1962. The first win in the history of C.J. Richards' promotion at Fairmont in 1962. 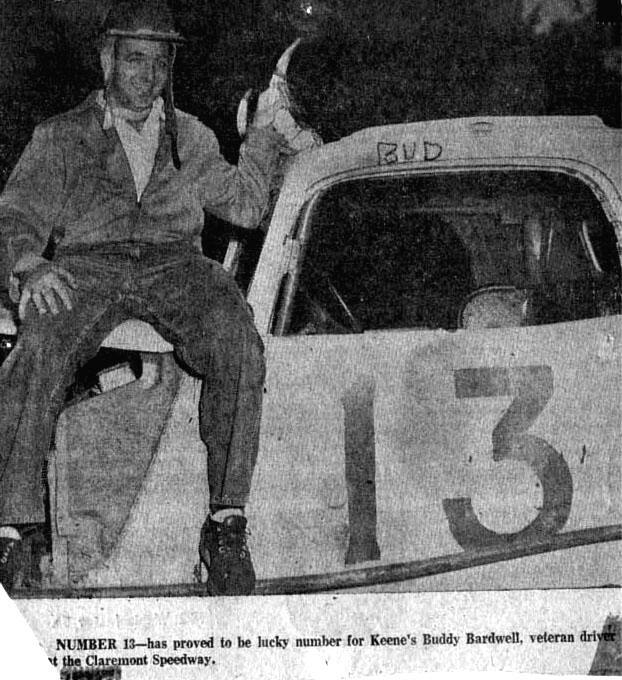 Either Buddy was short or the race sponsors were tall. 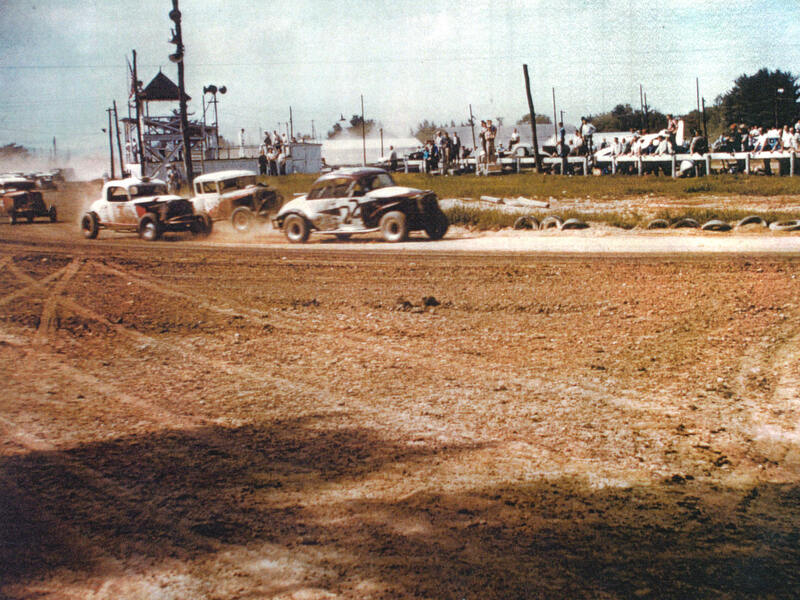 The T Road Ford at Otter Creek Speedway in 1962. Eventually in 1962, Buddy began to bring the Hudson to Vermont. Not sure where the horns are. Arriving for the big Rutland Fair show in 1962. Look hard and you'll see Buddy's car, right foreground, at the Rutland Fair in 1962. 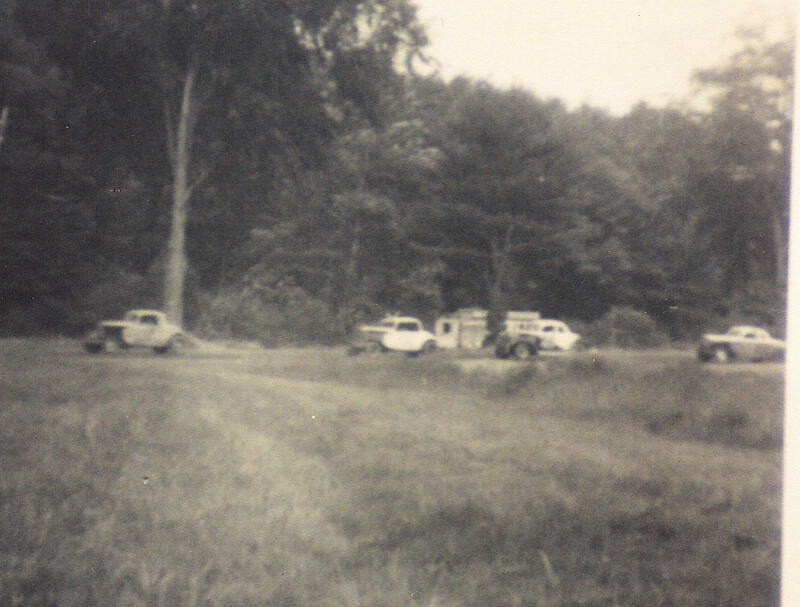 Arriving at Fairmont Speedway in 1963. 1962 old 8MM footage shows Bardwell lining up at Fairmont by Joe Spellburg. after that 1st Fairmont feature win. Claremont - early 1960's in the Jalopy Assn. era. Using his usual Hudson six, Buddy races Vince Quenneville and Chet Doaner in overhead V-8's in 1965. Using his usual Hudson six, Buddy races fellow Keene NHite Holward Stevens in an overhead V-8 in 1965. Using his usual Hudson six, Buddy chases Chet Doaner in an overhead V-8 in 1965. On the track at Fairmont in 1962. Around the end of running the Hudson in serious competition. 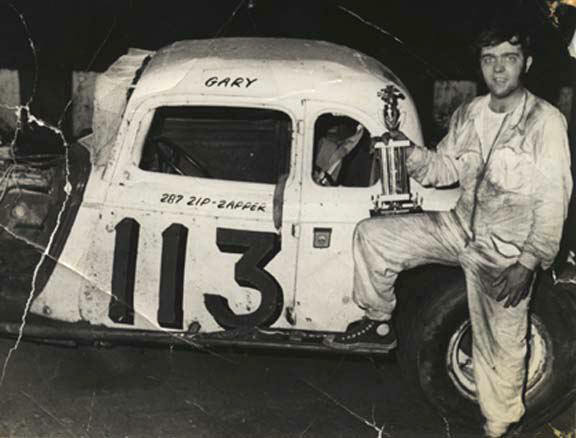 Gary Bardwell had a run at racing and winning, as well. The car at Old Home Days, Barre, VT. The car at Swaanzey, NH car show. A win late in the career. Buddy at a Ron Bouchard classic show around 2007. At Bouchard's, Buddy talks to Ernie Gahan with Don Rounds in the background. Buddy on the track at the first Northeastern Speedway reunion. 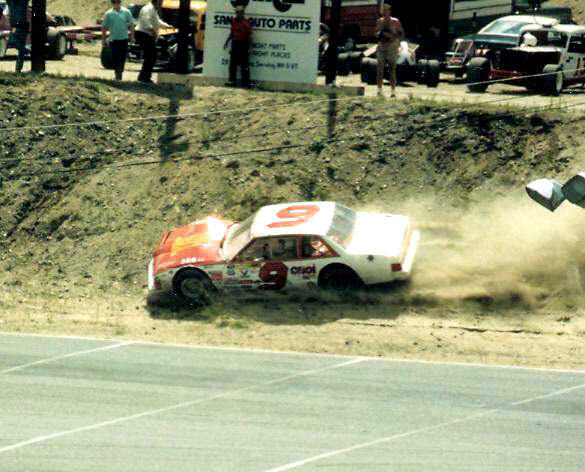 Buddy's car sits above in the pits in 1983 as Andre Bedard wrecks in a Claremont NASCAR North race. 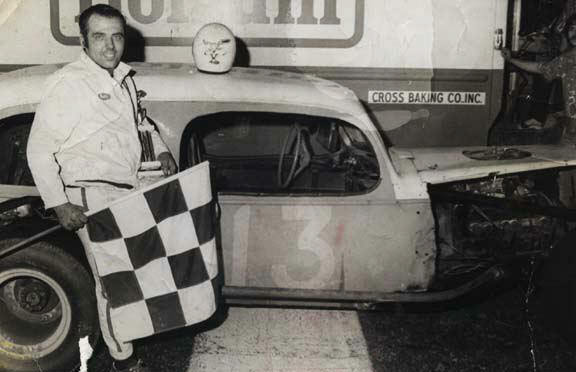 A vintage car win at Lebanon Valley.